The CDMK4 4-Mic Drum Microphone Kit from Avantone is a 4-piece drum-microphone kit makes it easy to capture kick drum, snare drum, and three toms, using drum-specific, 2nd-Generation Avantone dynamic mics. The CDMK4 is equally at home on stage or in the studio. The included MONDO kick drum mic has an aggressive frequency contour, handles 145 dB SPL, and is equipped with an internal shockmount assembly for the capsule, which minimizes the vibrations that cause rumble. For the snare, you get the ADM snare drum mic, which gives you similar voicing to the "industry standard" snare mic, but with better lows and an extended high-end. The ADM is also an excellent choice for high toms, bongos, congas, guitar cabinets, and many other miking chores. For the toms, the CDMK4 provides two ATOM tom microphones. These feature oversized capsules designed for capturing hefty lows and a penetrating attack. The mic has an internal shockmount assembly for the capsule, which helps prevent the vibrations that cause rumble. The ATOM is also recommended for large congas, djembe, and bass-amp cabinets. The kit also includes 3 PK-1 PRO-KLAMP drum mic mounts, which take the place of bulky mic stands by making it possible to attach the mics directly to the snare and tom rims. The PK-1s help reduce unwanted vibration, and make positioning the mics a snap. All four mics come with SSM shockmounts, which help decouple the mics from unwanted low-frequency transfer and vibration. All the mics in this kit feature die-cast zinc bodies, and have no plastic parts to break. The mics come in a custom, vintage-tweed case that features metal corners, locking latches, a high-density foam tray, a plush lining, and a faux-alligator trim exterior. The interior foam can be lifted out to provide additional storage space for cables and other accessories. The MONDO Dynamic Kick Drum Microphone from Avantone is a ruggedly designed kick drum microphone with an elegant finish that is also well suited for bass cabinets and other low-frequency signal capturing. The MONDO delivers aggressive frequency contouring and accentuates bass frequencies, leaving engineers to make very little EQ adjustments in both live sound reinforcement and recording applications alike. The dynamic capsule is capable of handling high SPL before distortion and is internally shockmounted for a high degree of resistance against structure-born noise. Its elegant Cabernet Wine-Red finish features nickel trim, rugged black grill and absolutely no breakable plastic components. 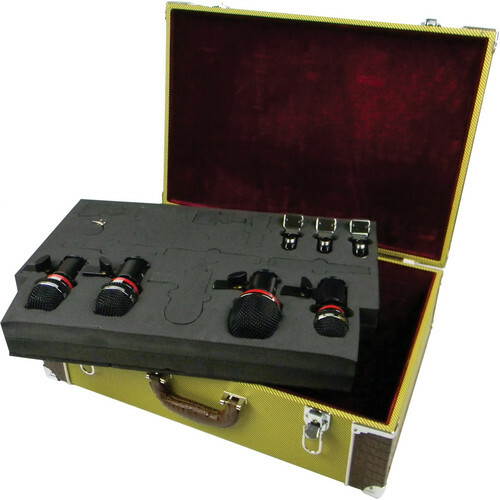 The microphone includes a shockmount (SSM) and rugged padded carrying case. The ADM Dynamic Snare Drum Microphone from Avantone is a ruggedly designed snare drum microphone with an elegant finish that is also well suited for percussion, guitar cabinets, and instruments. The ADM delivers a transparent, familiar snare drum sound for recording and live sound reinforcement. It features an extended low frequency response and extended high-end, making it a versatile solution for a multitude of signal sources. The dynamic capsule is capable of handling high SPL before distortion and features a cardioid polar pattern. Its elegant Cabernet Wine-Red finish features a nickel trim, rugged black grill and no breakable plastic components. The microphone is shipped with their PK-1 Pro-Klamp drum rim mount. The mount allows for close, adjustable positioning without bulky microphone stands, and is constructed with three stages of rubber dampening and decoupling material to suppress noise caused by vibration and rigorous playing. A shockmount (SSM) and rugged padded carrying case are also included. The ATOM Dynamic Tom Microphone from Avantone is a ruggedly designed tome microphone that is well suited for congas, bass cabinets, and other similar instruments. The ATOM delivers large low-end and fast, penetrating attacks for recording and live sound reinforcement. Its big-tone requires little or no EQ processing and the dynamic capsule is capable of handling high SPL before distortion, and features a cardioid polar pattern. Its elegant Cabernet Wine-Red finish features nickel trim, rugged black grill and no breakable plastic components. The microphone is shipped with a PK-1 Pro-Klamp drum rim mount. The mount allows for close, adjustable positioning without bulky microphone stands, and is constructed with three stages of rubber dampening and decoupling material to suppress noise cased by vibration and rigorous playing. A shockmount (SSM) and rugged padded carrying case are also included. The Avantone PK-1 Pro-Klamp Drum Rim Microphone Mount is a rugged drum-rim mount for close microphone positioning on snare drums, toms, percussion instruments and more. The PK-1 Pro-Klamp features 3 stages of rubber dampening that isolates the microphone against vibration noise, as well as protects the rim against marring. The mount easily attaches all standard 5/8"-27 thread mic clip attachments. The Avantone SSM Professional Shockmount greatly reduces microphone noise caused by vibration, handling, etc. The SSM features a weighty, all-metal construction that makes it durable and further aids against energy transference that may cause noise. Its 4 o-ring suspension bands are durable and made of a resilient ethylene propylene material that is highly resistant to breaks and tears. The o-rings may be attached horizontally, vertically, or crossed for added tension. The SSM will successfully mount Avantone microphones, or third-party microphones measuring 0.74 - 0.86" (19 - 22mm) in diameter. Box Dimensions (LxWxH) 12.15 x 4.95 x 3.2"
Box Dimensions (LxWxH) 12.1 x 4.9 x 3.3"
Box Dimensions (LxWxH) 12.1 x 4.9 x 3.2"
Box Dimensions (LxWxH) 6.0 x 3.8 x 1.2"
Box Dimensions (LxWxH) 7.4 x 4.4 x 1.6"